Recent studies out of the IBGC on the Digital Planet have highlighted how the adoption of digital technologies are impacting countries’ economies, competitiveness, their building of “smart societies,” and the building – as well as the undermining – of trust. Another area where the digital evolution is having a profound impact is Global Health – particularly in mHealth (mobile health) in low- and middle-income countries (LMICs). Driven by the increasing penetration of mobile, access to healthcare training and services in even the poorest and most remote areas of the planet is being transformed. 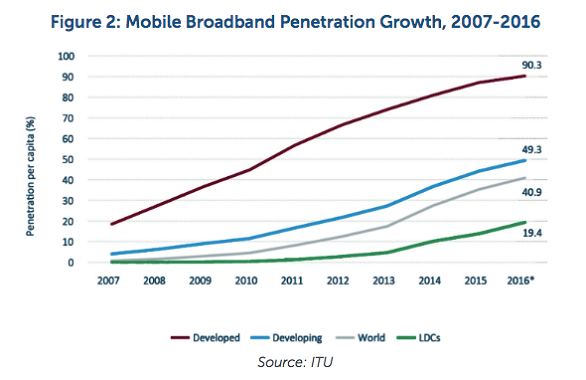 The Broadband Commission for Sustainable Development released a report (2/17) on the potential of information and communication technologies (ICT) on global access to healthcare. The graph below shows the growth of broadband access between 2007–2016. However, several other findings, listed below, are even more interesting. There are already over 165,000 mobile health applications! The scope and pace of innovations in mHealth is exploding. Based on a review of recent studies, reports, conference presentations, and interviews with practitioners – all conducted as part of the research for my GMAP thesis – these innovations fall into four major categories: public health surveillance, community healthcare worker(CHW) training and education, mobile applications for clinical services & diagnostics, and patient training and support. Jeffrey Sachs, the noted economist, wrote about the “transformative effect” of mobile phones on economies because they eliminate isolation. This same connection transformation is happening in healthcare. Frontline health workers can now upload infectious disease outbreak information instantly, nurses and midwives can easily review patients’ symptoms via WhatsApp, healthcare workers in refugee camps can use more accurate data to predict vaccine needs, and patients and their care givers can now easily communicate re: prenatal diet questions or HIV medication regimes and schedules. Some projects involve Ministries of Health (MoH) and enterprise-level health information systems such as DHIS2, others connect patients and caregivers via simple SMS text services or widely-used, existing apps, such as WhatsApp. In January 2018, the World Health Organization (WHO) released a “Handbook for the use of Digital Technologies to support Tuberculosis Medication Adherence” that details the impact of mobile phones on health-care worker and patient communications. But, a key take-away of the handbook is a simple intervention: using mobile phones and SMS to remind patients with multi-drug resistant TB to take their “cocktail” of medicine at the right time, level and sequence. One of the mHealth projects that has achieved national scale is Mom Connect In South Africa. Over 1.95M women and mothers are linked to 95% of the clinics in South Africa. They receive “stage-based” health messages and alerts, so that the moms and their babies can “thrive, not just survive”! Helpful and personalized reminders that alert expectant mothers: “at this stage of your pregnancy” you need to do XY or Z, are helping to improve maternal health outcomes. In Guatemala, Nitin Shrivastava, a Tufts graduate then enrolled in the UMASS Medical School’s Global Health Pathway program, pilot-tested an “adapted” iPhone to help in the early detection of retinoblastoma, a pediatric cancer of the eye. The iPhone’s camera was updated with an application for “computer assisted detection of Leukocoria” (CRADLE), which could detect “white eye”, a lead indicator for retinoblastoma. When detected early the cure rate is 95%. In more resource limited countries, the cure rate is 30%. Being able to use a standard iPhone to serve as a specialized ophthalmoscope will enable that critical, early detection. One of the more widely used health information systems that Ministries of Health (MoH) are deploying for public health surveillance and tracking services is DHIS2. DHIS2 is an open source HIS that was developed out of the University of Oslo; it is deployed in over 60 countries as of 2017. 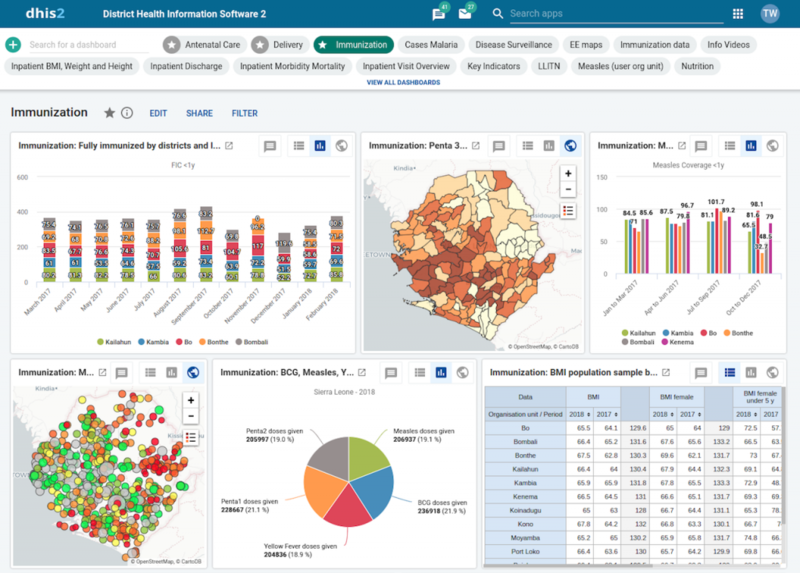 DHIS2 is a robust system that incorporates data analytics, visualization applications, GIS mapping and other features to provide healthcare workers and agencies with dashboards and insights complied from remote data sent from Java-based mobile clients. Although there is a low incidence of malaria in Zambia, the MoH is leading a national project to eradicate malaria in Zambia using the DHIS2 platform. CHWs in their villages use Java-enabled, mobile phones to report on tests or outbreaks in their area. They are equipped with diagnostic tests and malaria medication, but the real power comes from the MoH being able to easily aggregate data from across the country and quickly see any trends, progress or concerns. While the breadth of innovations and use cases is impressive, there are barriers to adoption. Technical issues, from challenges with the electric grid to Internet or mobile IT infrastructure gaps, exist. Training workers on applications, as well as how to support and maintain some of the devices can be difficult – as is planning for funding and sustainability post-pilot. Two oft-cited issues are tied to patient data security and problems with interoperability. However, the pace of adoption, and the demographic trends in many LIMCs that are driving up the need and demands for healthcare, in exactly the areas where trained healthcare professionals are in short supply, would indicate that as these barriers are mitigated, the growth of mHealth will continue its upward trajectory. Using simplicity as a design goal – some of the more impactful projects involved simple communications – appointment reminders, peer-to-peer connections or timely medical or developmental alerts. National level HIS are critical too but limiting the complexity of an overall intervention can spur quicker and wider adoption. As “Building Smart Societies: Blueprint for Action” suggests, one outcome of deploying digital technologies impacts the “well-being of people”, and where mobile health interventions are done well, the impact on quality of life can be significant. Mark is currently completing a Masters in International Relations through Fletcher’s GMAP, with a focus on Global Health. He joined Tufts in 2017, after 30+ years in the IT industry, @ NetApp, Oracle and PeopleSoft.